If your shop was created with the use Magento then you can synchronize it with your app on ibuildapp.com. Your app content will be renewed each time you make changes on your Magento shop. To integrate your Magento shop into the app refer to your app, choose Shopping Cart widget from the list of available features. 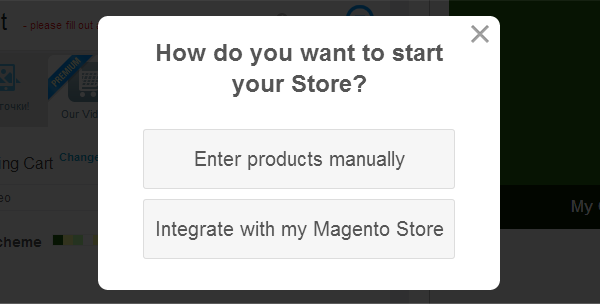 Then you will be asked if you would like to enter products manually or you would like to integrate Magento. From the Admin menu, select System > Web Services > Roles. Click the Add New Role button. To provide limited access to data, set Resource Access to “Custom.” Then, select the checkbox of each resource that is available to this role. By default, when a area is selected, full access is granted. You can accept the default, specify the actions that a person is allowed to take. Specific types of access are listed under many of the resource links, so it is easy to determine exactly what a user is allowed to do with each resource. When complete, click the Save Role button. From the Admin menu, select Web Services > Users. In the API Key field, enter a verification key or password. This is the credential that third-party web services must use to access your Magento Go store. To confirm, re-enter the key in the API Key Confirmation field. In the panel on the left, select User Role. Then, select a Role for the user.